Winter can be a rather bleak affair. When you’re in the thick of it, it feels like there is no escape; homes dimly lit by the winter sun and cold that envelops your whole body. If I’m honest I would rather be transported to a warmer climate, maybe sitting on the beach enjoying a summer salad and some fresh seafood too. I don’t much care for winter, I simply endure it (hopefully without too much grumbling!). Seeing as I’m not sitting on a beach but in southeastern Ohio, I must embrace even the bleakest of winters. There’s something about winter, maybe the lack of sunlight and cold temperatures, that can put our bodies and minds into a depression and dormancy. It’s important that we not let our eating habits fall victim to this. I think most of us turn to our comfort foods as a consolation for the cold. Although I don’t tend to crave many processed foods anymore, I am a sucker for raw cookie dough! I can always take the hint when afterwards my belly starts hurting. I’ve never had an upset stomach from eating fruits and vegetables. The biggest thing I notice about winter eating is a feeling of scarcity. In the spring we get to enjoy a plethora of fruits and veggies – tomatoes, watermelon, cucumbers, strawberries, blueberries, and the list goes on. It is very easy then to come up with a delicious spring or summer salad. If you are at all concerned about seasonality you may get to winter and think, “Well, there’s nothing to eat now.” The good news is there’s still wholesome food to eat while being food conscious at the same time. Citrus is a saving grace in the winter months. It is packed with vitamin C, antioxidants, and the pop of color alone is enough to cure even the most pervasive winter blues. Surprisingly enough, the peak growing season for oranges in the U.S. is December to March – in California, Florida, and to a lesser extent Texas and Arizona. So this time of year you can find different varieties of oranges far cheaper and in greater supply. 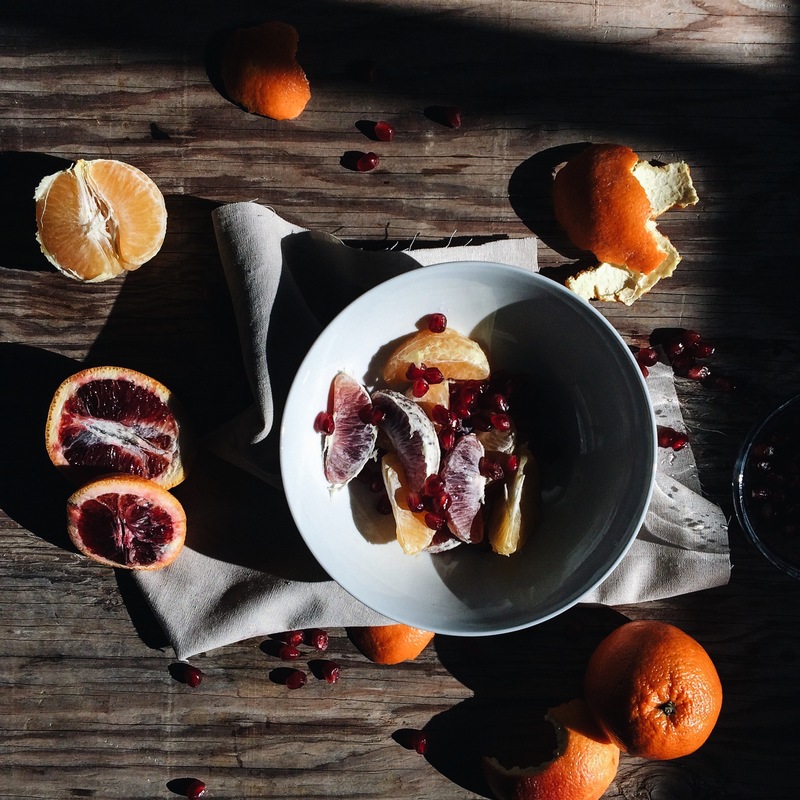 These include blood oranges, grapefruit, tangerines, pomegranate, etc. It’s very easy to throw these in a salad, include them in your favorite dessert, or make a juice drink out of it. The good news is you don’t have to be a master chef or buy expensive ingredients to eat well this winter. Just make sure your plates have plenty of color. Like this organic purple kale salad that I enlivened with some blood oranges, apples, walnuts for protein, and blue cheese for added decadence. I then topped it off with a pomegranate vinaigrette. I used fresh pomegranate juice from a pomegranate fruit because you can get them for really cheap right now! Although I have not yet perfected the vinaigrette (It turned out too runny for me. Because you’re getting more water here than with a traditional vinaigrette, I would try using balsamic vinegar, dijon mustard, or honey to thicken it up), here’s a great recipe for you to look at in the mean time! 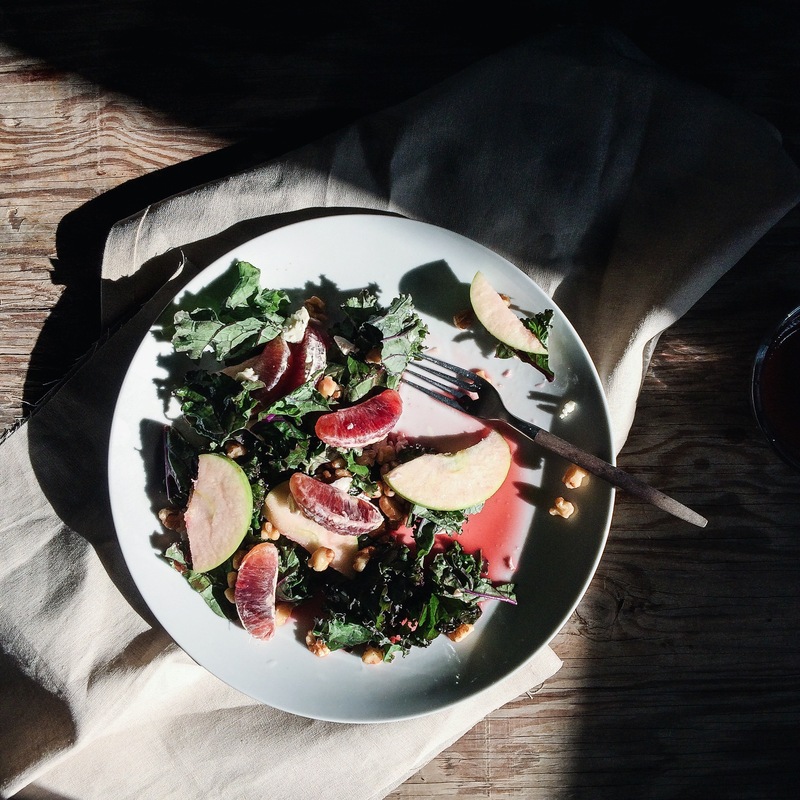 Just because the weather is bleak right now doesn’t mean your diet has to reflect that. I can tell you this salad is packed with so many antioxidants, vitamins, and nutrients that cookie dough can’t hold a candle to this. It is possible to eat seasonally well this winter it just takes some thinking outside of the box and the willingness to go beyond your food comfort zone. Your body and the environment will truly thank you for it.